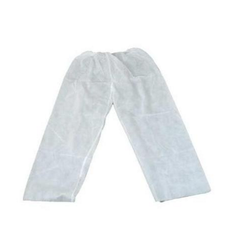 Our product range includes a wide range of disposable pant. Made from the best quality raw material, our offered range of Disposable Pant has been widely demanded its major features of the long lasting life cycle and superior built quality. These offerings come with universal fittings, prevents clothes from a contract with dust and liquid. The basic raw materials include bond polymer non-woven fabric and spun-lace fabrics. These fabrics ensure that they are light weighted. Our products have excellent in water repellent and air permeability resulting in providing comfort & dryness resulting in anti bacterial and anti fungal resistance.